The giraffe is the tallest living mammal on the planet and its famous long neck is not the only body part which accounts for this record. Although the neck of a giraffe is about five feet long in the case of female giraffes and seven feet in the case of males, giraffes also have towering legs, which can reach nine feet in length (for females) and 11 feet (in males). The imposing height of the giraffe enables it to feed itself more efficiently than other tall animals because it has access to leaves on trees reaching as high as 15 feet. Its extremely long legs give it the advantage of being a speedy runner, especially when sensing an eminent danger such as a lion, a leopard, or a pack of hyenas approaching. Its elongated legs are also very powerful defense tools. A kick with one of its legs has the ability to knock down a lion. According to the Giraffe Conservation Foundation, the height of adult male giraffes (also called ”bulls”) and female giraffes (also called ”cows”) differ considerably. The height of a bull can typically reach up to 18 feet. The shoulder height of a male giraffe averages about 11 feet. The height of an adult female giraffe can reach up to 14 feet and its shoulder height can be up to nine feet. A newborn giraffe, or calf, has an average height of six feet and usually male calves are slightly taller than female calves at birth. A baby giraffe typically grows another six feet during its first year of life. The extreme elongation of the neck takes place mostly after birth. 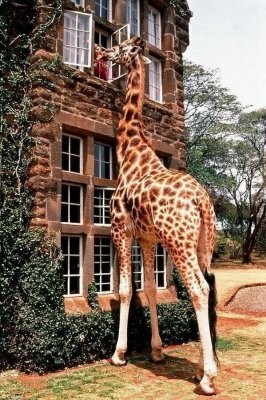 The tallest recorded male giraffe was named George. He was a resident of the London Zoo and reached a whopping height of 19 feet 3 inches. On the other hand, the tallest recorded female giraffe is Shackie, who lives in Tanzania and has a height of 22 feet tall and a weight of 5,100 pounds, which also makes this majestic female giraffe the heaviest giraffe ever recorded.